Interviewing Aida Kasymaliova. Bishkek, Kyrgyzstan. 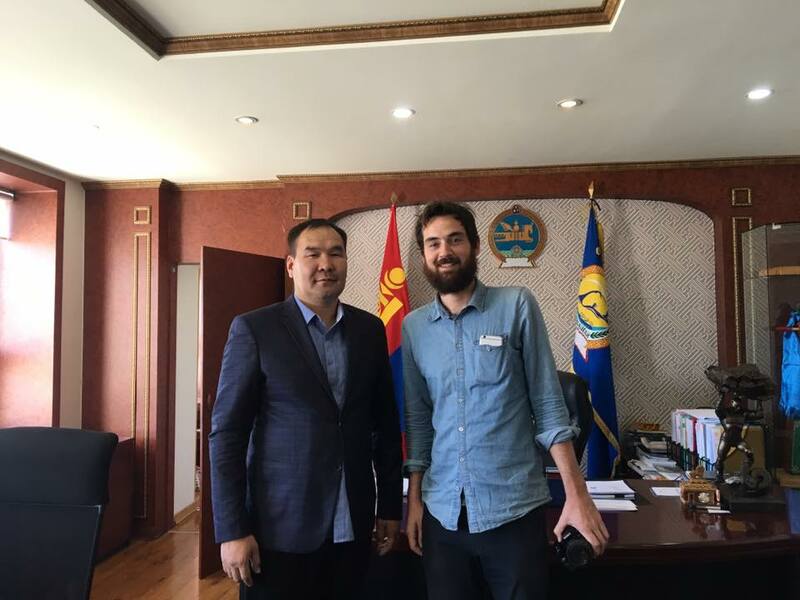 With the Governor of Arkhangai Province, Mongolia. Edward Cavanough is an Australian writer and researcher. His commentary, analysis and journalism focuses on politics, policy, international affairs, and travel. Edward's writing and photography has been published in Foreign Policy, Al Jazeera, ABC News, the South China Morning Post, The Hill, The Guardian, The Sydney Morning Herald, The Huffington Post, The Diplomat, The Lowy Interpreter and others, and includes reporting from Afghanistan, China, Cuba, East Timor, Mongolia and Vanuatu. He is the Manager of Policy at The McKell Institute, a progressive think-tank based in Sydney. Previously, he was the Australian Foreign Policy Fellow at Young Australians in International Affairs in 2016, and interned on the re-election campaign of US Congressman Denny Heck (D-WA10) in 2014. Edward has authored major public policy reports into diverse issues such as economic inequality, international trade, retirement adequacy, industrial relations, indigenous policy, workplace entitlements, tax reform, energy policy and infrastructure provision. He has presented his research at public forums, local and national radio, on television, and delivered expert testimony to the Parliament of South Australia. Edward's research has been regularly covered by major Australian newspapers and media outlets. Notably, his research on the economic impact of reducing penalty rate pay played a central role in the national conversation on Australian wage policy. An avid traveler, Edward has visited over 60 countries across Eurasia, the Americas, Oceania, the Caucasus, and all corners of Europe. In 2018, Edward completed a 23,500 kilometer overland journey from Adelaide, Australia to London, England, travelling across 36 countries and three continents over 244 days. A reformed Jazz student, Edward wrote and produced an independent instrumental record in 2014, touring the record with a baritone ukelele, loop pedal and 2011 MacBook across Australia, the United States, and in Iceland. He holds an MA in International Relations from The University of Sydney, and a BA in History & Political Science from the University of Adelaide.